The next stage of the Samsung vs Apple rivalry could be taking place right on the high street, with a report that Samsung is looking to up its retail game in the US. Samsung has swiped ex-Apple Store designer Tim Gudgel, according to The Information, suggesting it might be looking to set up its own full-sized retail stores. Two people "close to the company" claim that Samsung has hired Gudgel to work on "deeper investment in US retail". Gudgel specialises in store design, so it's pretty obvious what Samsung is up to here, assuming these details are true. Samsung's retail presence certainly isn't small right now – there are a number of Samsung Experience Shops in shops around the world - but having its own full-sized stores would be a massive step up. It might be needed too, what with Microsoft pushing out its own retail stores in the last few years.. 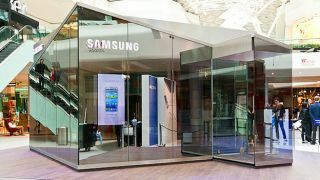 Whether Samsung will offer up its own version of Apple's in-store "geniuses" remains to be seen. If it does, we'd like them to be called Guardians of the Galaxy. All well and good, Samsung, but will yours be able to float on water? No wonder these are good times for Samsung - that Note 3 ain't doing too badly right now.